At the beginning of the month of October we echoed the new releases of Microsoft. Between convertibles and tablets stood out a product that Microsoft does not have us especially used. Headset that this time come with the Surface seal . These headphones respond to the name of Surface Headphones . Noise canceling headphones and integrated Cortana of which we knew their details and among all the relative, one that did not like too much referred to availability. The Surface Headphones were not going to leave the United States … until now. And thanks to Windows Central we have known that Surface Headphones will reach other countries . In particular, the citizens of the United Kingdom are the first outside the country of the stars and stripes can be done with these headphones but for now the date is not known in which they will be available. Regarding the headphones, we must remember that it is an over-ear model in which it has been decided to introduce an active noise cancellation system (to achieve this use 8 microphones) to improve the listening of the audio without internal interference that offers up to 13 levels of cancellation and up to 30 dB. The control is regulated by means of a mechanical dial located in the headset vault that allows the user to modify the insulation intensity. They mount in their interior two speakers of 40 millimeters that offer up to 115 dBof musical power. Also highlight the support for Cortana, so that it starts with just giving a verbal command, at which time the audio that is playing stops automatically. Regarding autonomy, the Microsoft Surface Headphones allow a continuous use of up to 15 hours using the Bluetooth connection , a figure that rises to 50 hours if we use the 3.5 mm jack. And here, Microsoft has used the USB Type-C port to load them. 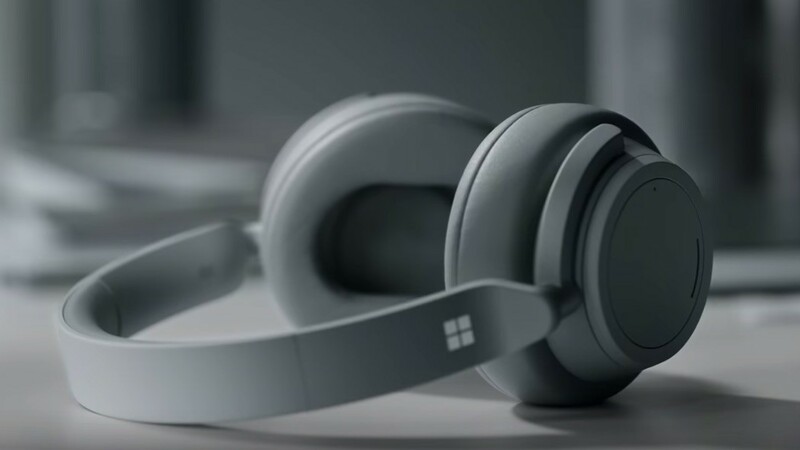 The Surface Headphones can be booked from November 15 in the Microsoft Store for $ 350 in the United States with orders that will be sent from November 19, 2018.